Organization is crucial when working from an enclosed truck or trailer. The SO-1 will safely secure both single and double edge hedge trimmers up and out of the way. Simply attach SO-1 to the wall using its two attachment points. •Thick, replaceable rubber pad protects gear case. •Plated finish stands up to the elements. •Includes a heavy duty stretch cord. 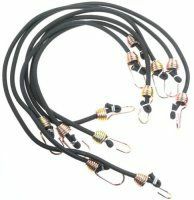 Highest quality stretch cords, 24" long, originally developed for the trucking industry. 100% latex center protected by a double sheath, anodized hooks. This heavy duty stretch cord will outlast several of the variety store stretch cords.